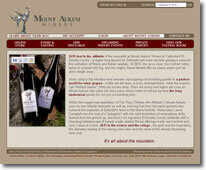 Mount Aukum Winery is a medium-sized winery in California that makes over 20 different wines. Their primary income came from tasting room purchases and restaurant/bar distribution, so they looked to a CartFusion solution to sell their wines online to customers throughout the United States. Trade Studios designed an age-verification program to make the sale of alcohol on their website possible and secure. Now, with CartFusion's discounts feature and the implementation of a mailing list manager, they regularly offer their "Club 2615" members discounts on volume purchases, free shipping, and other goodies that make doing business with them more rewarding.